40 rounds, all on target, in 6.48 seconds. Yeah, he's that good, and he really does rock with that Tavor! Try To Compromise With The Devil? NFATC Finds Out Why You Shouldn't. The National Firearms Act Trade and Collectors Association it seems just helped the ATFE and DOJ screw over owners of NFA items quite nicely. While it was admirable that NFATC in its proposal for rule-making to BATFE requested that the requirement for Chief Law Enforcement Officer (CLEO)signature be done away with, they unfortunately didn't stop there. The morons also requested that responsible persons for NFA trusts, corporations and the like have to submit to the fingerprinting, photo and background requirements as individual applicants must. Note there really hasn't been any problems extant with such Trusts and Corp owners all this time, so why the hell did they bring it up? Why now, when there's all the clamor for gun control and Obama and Holder hold control of the levers of the executive branch? Do note that many people form the Corporations and Trusts because their CLEOs unreasonably refuse to sign their paperwork and may do so both arbitrarily and capriciously and there's no redress for such refusal. While my CLEO is reasonable about signing off, there's no guarantee a successor will be in the future. Requiring permission or the acquisition of legal items based on the mere whims of an official seems rather un-American to say the least. Of course, with use of this brilliant proposal as the excuse the ATFE went off and proposed a rule as a result that agrees with requiring responsible persons to go through the background check, but keeps the requirement for CLEO sign-off. Thanks to this bit of rule-proposing brilliance, we get the worst of both worlds - The proposed rule now is that the CLEO sign-off requirement remains and Trusts and Corporate responsible officers are subject to it. Nicely done NFATC, nicely done. Hat Tips to SayUncle and Prince Law Offices PC blog. A jarring report out of North Korea that claims Kim Jong Un’s former girlfriend was executed by a firing squad last week ...... Chosun Ilbo said it is unclear if Kim’s wife had anything to do with the deaths; before becoming the spouse of the “dear leader,” she was also in that same orchestra. Kim had reportedly known Hyon for about 10 years, and their relationship ended at the orders of Kim Jong Il, though rumors have persisted that the two were having an affair. While its good to be the King, it's bad to be the King's ex-girlfriend, especially once he's married and either he or the wife wants you out of the picture permanently. Just when you thought they couldn't make more of a clown show of the mayoral election they've found a way to do it. Currently, Mike Duggan has the lead with 44,935 votes and Benny Napoleon is in second with 28,352 votes. Even a Detroiter/Wayne County denizen should be able to do the math, right? Not so fast. It appears that 18,000 of Duggan's votes are being contested by The Wayne County Canvassing Board and County Clerk as the clerks "forgot" to use hash marks on them (note that there is no statutory requirement to do so...) and Lo, The Wayne County board of Canvassers was about to toss them all out with a decision being made on the last possible day so election workrs couldn't fix the "mistake". This would put Benny Napoleon in the win column. Convenient, no? Wayne County Clerk Cathy Garret, coincidentally I'm sure, "is the sister of AFSCME Council 25 President Al Garrett, who is backing Napoleon." Convenient, no? That's Wayne County and Detroit For you, and this is now going to the State level to resolve. The Detroit Mayoral Election follies are not over. A nice corrupt little game in Detroit involving Democrat candidates going into churches during services to pray for votes, in return for cash to a "church lady" for access and one candidate allegedly reneges on the fee and the whole thing gets brought to light. She’s known as the church lady — and she’s sticking it to a judge. Detroiter Jean West, who has spent four decades helping political and judicial candidates land speaking engagements at Detroit churches, is suing 36th District Judge Wanda Evans, claiming Evans stiffed her on a $3,500 bill during last fall’s election. The 77-year-old plaintiff, a retired nurse who dived into politics after helping the first black woman get elected to Detroit’s City Council, called it a first. Never in her 43 years of working on campaigns had she ever gone unpaid, she said, despite her old-school methods. When candidates seek her services, West brokers deals with a verbal contract and a handshake, promising to get them into as many Detroit churches as possible. And when she wants to get paid — her typical fee is $350 per week — the clients meet her in her backyard or at her dining room table and pay her, usually in cash. No invoices. No formal contracts. She gets paid. It's also an interesting expose about what "community organizing" really means - pay to play for access and endorsements for votes. According to religious, political and judicial figures, she’s the go-to person for anyone who is running for office and wants to speak in front of church crowds. West was connected to the pastors, and the candidates knew it. West also noted that she was returning a favor to Evans, who had sent her clients in past elections. For example, she said, it was Evans who steered former State Supreme Court Justice Diane Hathaway her way when Hathaway ran for judge. “I was her church lady,” West said of the now imprisoned Hathaway, who pleaded guilty in January to bank fraud. Of course, had this been a white Republican campaigning in churches to get out the vote during services, I'd expect the ACLU might raise a bit of fuss about these pay to pray arrangements. I'd also be unsurprised if an IRS inquiry over all this cash changing hands took place. However considering this is a connected Democrat community organizer turning out the church vote for cash, I doubt much will come of it. My bet, this scandal will be in the paper maybe one more day, then it'll fade away, and the Dems will be back to business as usual in Detroit. Hat Tip to Murphy's Law for telling me about the story last night. So this morning started at 0600 with Jett declaring vociferously from his crate that he needed to go out NOW. I got up, took him outside and fed him his breakfast. He's livening up quite a bit since yesterday, no longer hiding out under the kitchen table. He's now exploring his environment more and interacting with me and the kids. 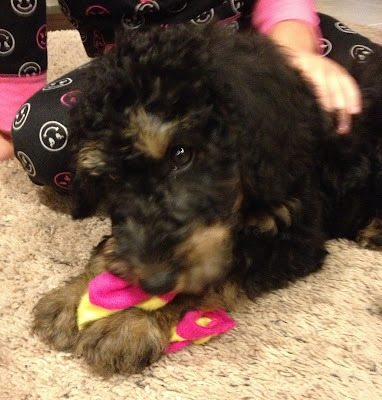 He really got happy when he found Leah's sock lying on the floor and he proudly carried it to a comfy spot. Life around here is about to go to the dogs, or the dog in this case. 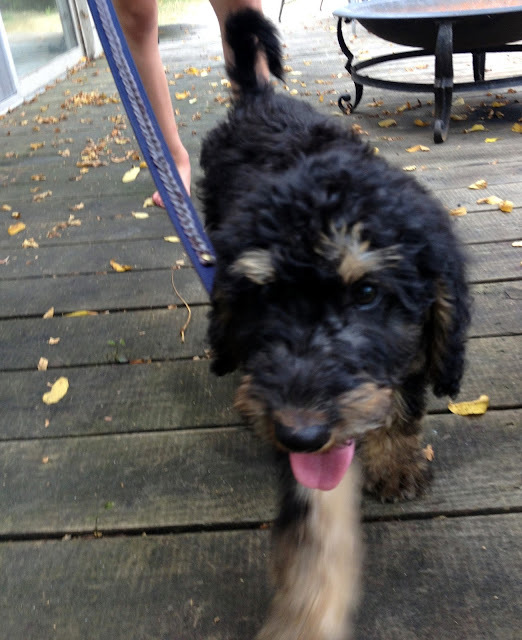 A warm welcome to our new pup, and I finally have a boy around here to help balance the gender ratio a bit. 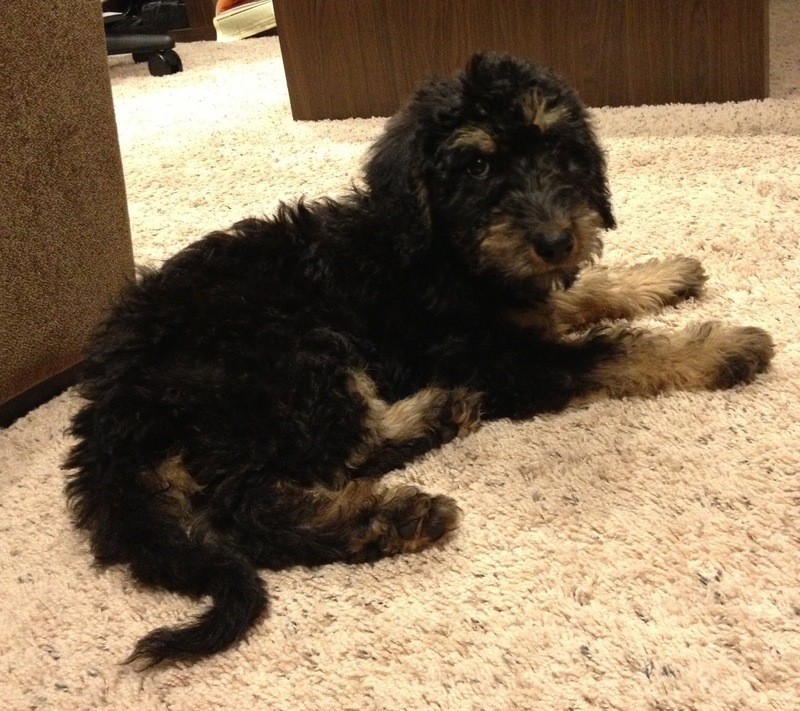 He's an Airedoodle - half Airedale terrier, half Poodle and all of 10 weeks of cuteness and fur. 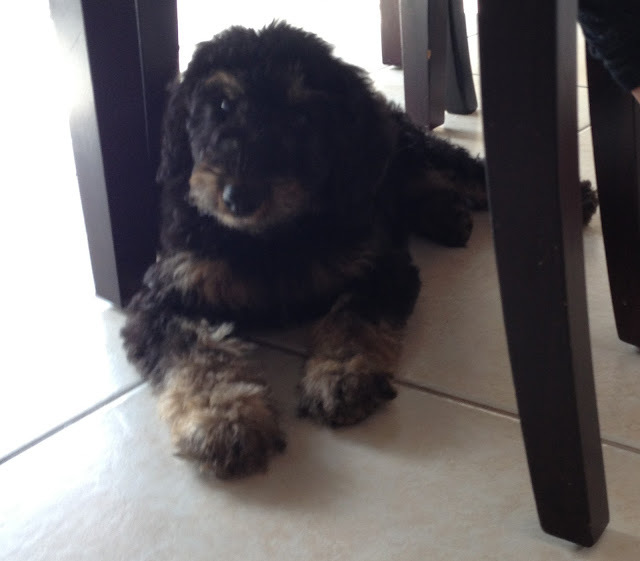 His name as chosen by the kids is Jett. 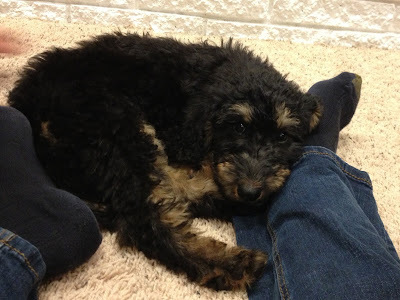 He's all about being an Airedoodle so the air part of him naturally led to his name being Jett, that and his good energy and maneuverability. Not sure where the extra T came from, but he avoided being called Cessna, so he's got that going for him. He seems to be adjusting well with a bit of separation anxiety from his fellow pups and the farm where he was bred. The kids are thrilled, and we now have a dog again and all is as it should be. Expect lots more dog blogging to follow. In addition to playing with the kids, climbing rocks and canoeing until my arms fell off, there was ample time for reading for pleasure and enrichment. One of the books I read was American Gun: A History of the U.S. in Ten Firearms by Chris Kyle. As you likely know, Chris Kyle is not just any author. He previously wrote American Sniper: The Autobiography of the Most Lethal Sniper in U.S. Military History about his experiences as a SEAL chief and racking up at least 150 kills while saving American lives in Iraq. As you might expect, he knows quite a bit about guns, and he knows how to impart his knowledge to the reader. Sadly, Mr. Kyle was untimely killed by a man not even fit to shine his boots before he could finish American Gun . It was his wife, along with Jim Defelice and Wiliam Doyle who brought it to completion. The book details in ten chapters ten firearms that have left their mark on American history: The Kentucky Rifle, The Spencer Repeater, The Colt Single Action Army, The Winchester 1873, The 1903 Springfield, The 1911, The Thompson SMG, The M1 Garand, the .38 Special revolver and the M16. The book describes each rifle, gives the history of its development and background regarding its adoption and use and the book vividly illustrates at least one episode and often many occasions where the firearm had a major impact on America. Heroes such as Wild Bill Hickok, Teddy Roosevelt, Alvin York, Leigh Ann Hester, and many others are featured, as are Rogues like Al Capone, the Dalton gang and others. Other firearms are described and compared and contrasted, especially when they faced off against one of the featured ten. The book is well written, well referenced and well indexed, with a quick-paced narration that brings Mr. Kyle's observations about the merits of each firearm and its employment to the fore. It's a darn good book and well worth a spot in any firearm aficionado's or enlightened amateur's library. Just returned from the annual family gathering in Huntsville, Ontario. 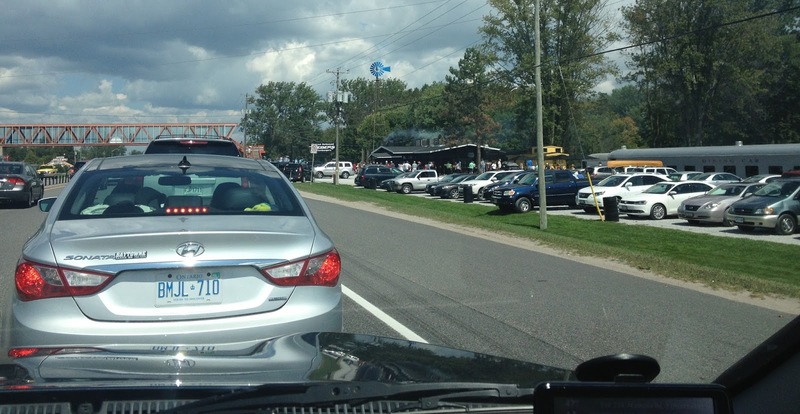 It was nice to visit the folks and see all the cousins, but it's quite the distance away, seven hours without heavy traffic, and since this is towards Toronto and Toronto's route to cottage country, there was heavy traffic. On the way up last Friday we hit a traffic jam on Highway 400, broke free of that and then after 10 miles or so on Highway 11 hit a traffic jam where it took an hour to go 3 miles. Why? Well, they had one of two lanes northbound closed for construction. But, they weren't doing any work on it, there were all of two workers standing there jawing as we went past, and in fact they took down the cones about 2 hours after we left, according to other family members stuck in that mes at that time. Nice. In addition, we passed by Weber's, a burger joint so popular they had to build a footbridge over Highway 11 to avoid people being struck by cars crossing the highway to get a burger. Both northbound and southbound parking lots were packed. While good, in my humble opinion it is rather overrated and not worth the long lines. While it's much better than a fast food joint, there are lots of other superior and much less busy burger places about, but its got a dedicated following and it is in an otherwise rather food-less spot on the highway. Yes, the people you see in the picture near the top right are lined up to buy a burger, and the parking lots on both sides are full on a Friday afternoon. We arrived up at the cottage and the rest of the family started rolling in. It was good to see all the cousins, including our newest cousin, a 2-month old baby boy who was rather easy-going and angelic the whole time. On August 17, Leah celebrated her 7th birthday with all her cousins at the cottage and had a great time doing so. I spent many a day taking the kids and cousins swimming, paddle-boating, kayaking, and canoeing. On August 20th, After taking various lots of the kids on numerous canoe trips around the bay, I took Abby alone on a canoe ride to the island cottage. This is a cottage sitting put in Lake Vernon on its own little island. It looks rather mysterious set by itself on the small island and the kids always wonder about it. It's been recently renovated so it no longer looks quite so abandoned. Doesn't look all that far away, right? It's just outside the bay and should have been a 15 minute or so trip there and 15 minutes back. Easy right? Well, as we left the bay, there were some waves and a pretty darn good current going that was pushing us way off from the get-go. We reached the island then as we turned around to get back the current really got a hold of us and it was impossible to head straight back. Instead it took over an hour and a half to fight our way through the current around and back to the cottage. We got pushed way out of sight of the bay and the folks at the cottage were almost to the point of either calling search and rescue or finding a neighbor with a motorboat to start searching for us before we made it back. While I initially had the theme song from Gilligan's Island in my head as the current took us off course, Abby quickly replaced it as she was stuck on a new song her cousins had taught her and she kept singing it: "Dumb Ways To Die". I managed to get us back, and doing so without tipping Abby off that we were in a bit of a bad situation in that we couldn't simply get back to shore and had to paddle through some serious current, I just explained we had a little current so we were taking the long, scenic tour back. Lots of hard, continuous paddling was involved. But we made it and I had the paddling workout to last me a whole week worth of exercising. Back at the cottage, Yoda congratulated me on getting back and for living up to the adage: "Do or Do Not, There is no Try". 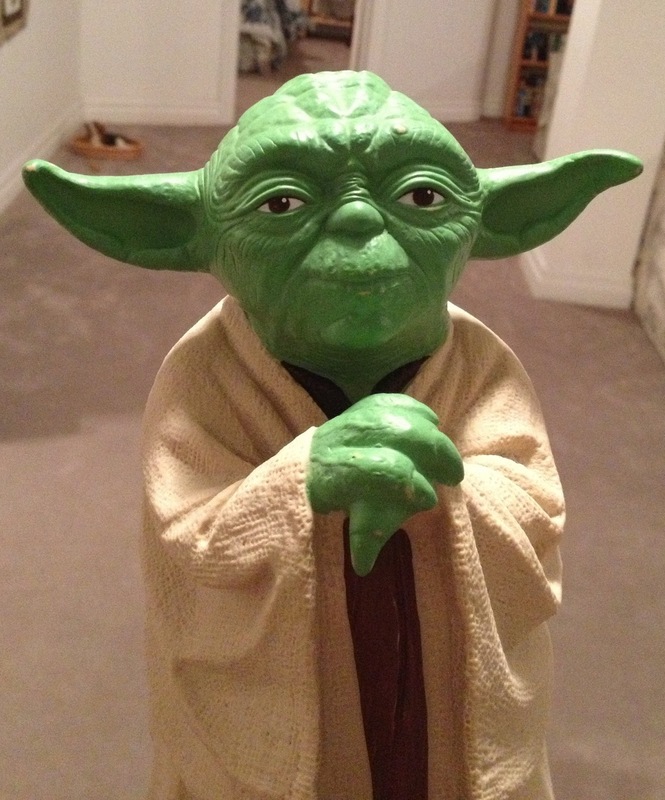 Back from long canoe trip you are, mmmm. We also did a day trip to Arrowhead Falls, which was a nice hike to a very scenic spot. The kids all got along splendidly and everyone had a great time at the cottage. The drive back unfortunately got us stuck for a couple hours in Toronto traffic so it took over 11 hours to get home very late last night. Aside from the madness of traffic, it was a lovely family reunion indeed. Continuing the trainer theme, there was a rare trainer on display at Thunder Over Michigan: The AT-11 Kansan. 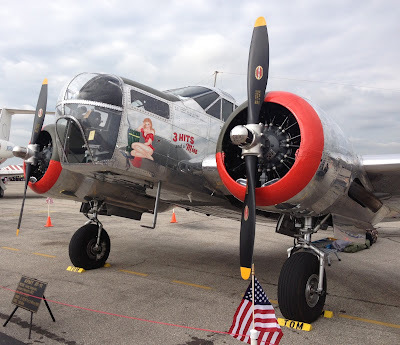 The AT-11 was a Beechcraft Model 18 turned into a bomber trainer for training bombardiers, navigators, and gunners before they got to the big bombers during World War II. Left all polished and shiny, and with red engine cowlings, this one is a flying work of art. 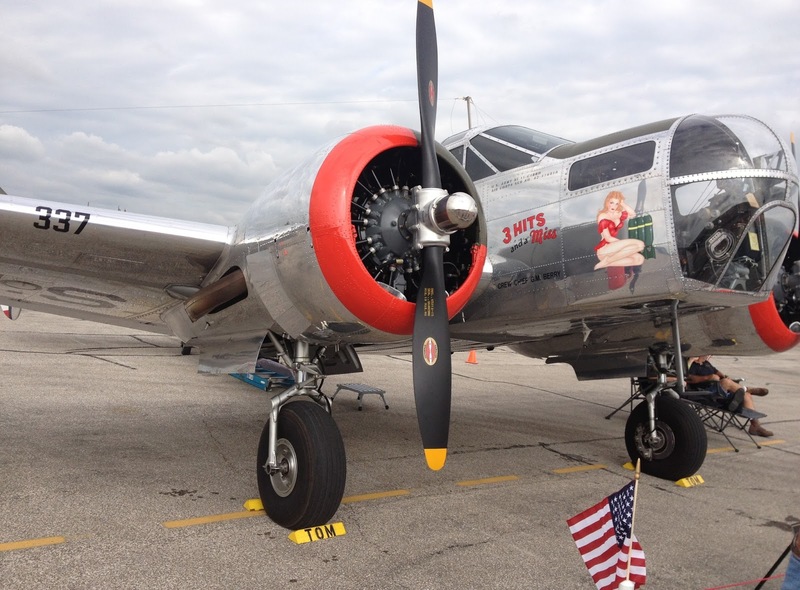 Named Three Hits and a Miss, this aircraft is a very pretty example of the type. 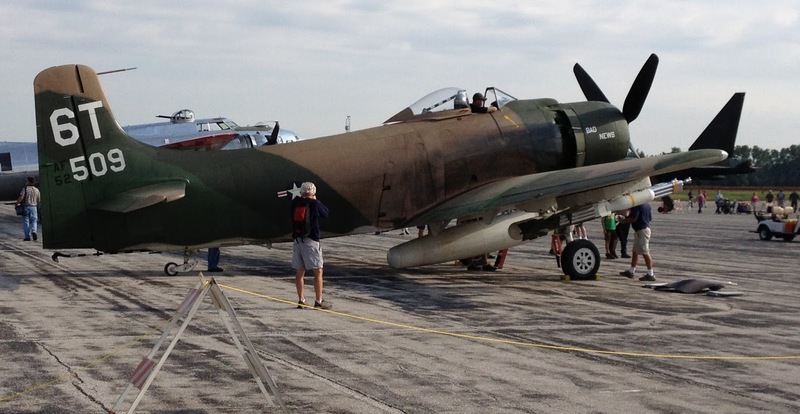 A very nice and often overlooked and unrecognized World War 2 American aircraft. A DeHaviland Vampire to be exact. The de Havilland DH.100 Vampire was an early British jet fighter. With a top speed of 548 mph, and armed with 4 20 mm cannon and able to carry rockets and bombs, this 50's fighter served the British Air Force and Navy and 30 other countries' air forces, and went on in British service in a training role into the 60s. This is a very nice example of a Vampire. 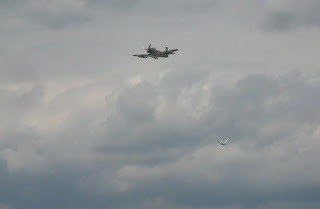 Sadly it didn't perform as the Vampire power assisted takeoffs are a sight and sound to behold. It also had some pretty cool nose art. A fine flying example of the second jet fighter aircraft to enter British service. 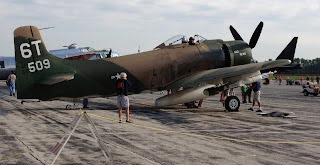 Thunder Over Michigan had quite a few privately owned jet warbirds in all their glory on the field. No, that's not another A-4 Skyhawk. A Czech advanced jet trainer, it was the mainstay of the Warsaw Pact Air Forces trainer fleets. She's quite the beauty of a plane. A two-seater with a top speed of 466 mph, a range of 683 miles without external tanks and 1,087, miles with externals and a service ceiling of 36,000 feet, she'd be my pick for a jet trainer warbird. These birds are quite available at the moment and while out of my price range are relatively affordable.One day I'll get a pilot's license, build up time and one of these shall be mine. 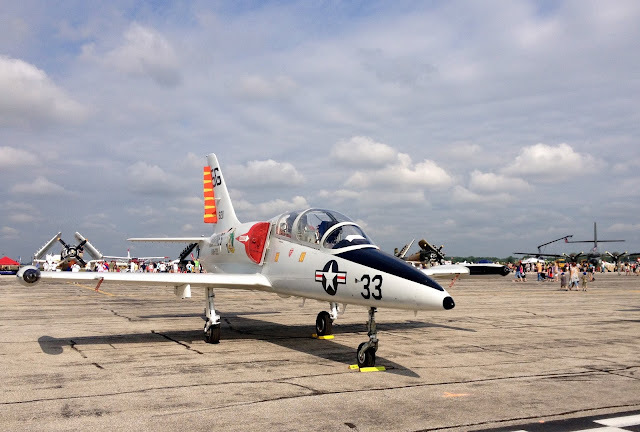 The L-39s little brother was also present at the show - The L-29 Delfin. Designed in the late 1950s as a jet trainer, the L-29 was a very effective 2-seat jet trainer. 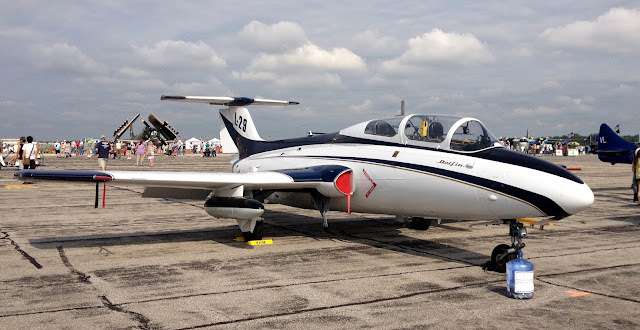 With the L-29 having a top speed of 407 mph, 555 mile range, and service ceiling of 36,100 feet, grass field capability and currently going for much cheaper than the L-39s, she'd do nicely as well. Unfortunately, neither the L-39 nor the L-29 performed during the show, but they sure were nice to look at and dream about. 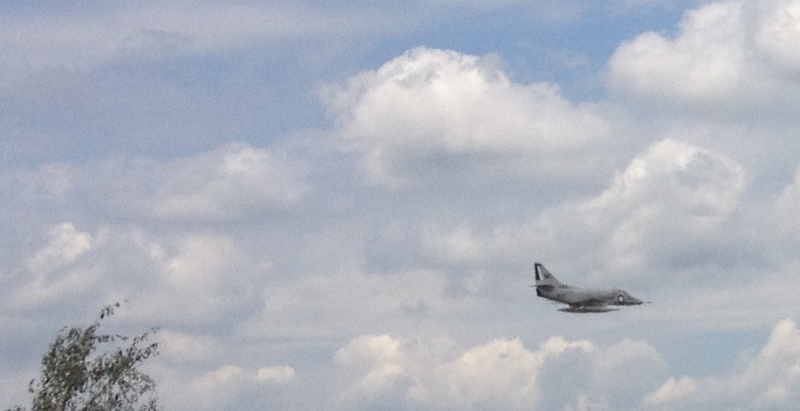 The A-4 Skyhawk was one of the highlights of the show. Designed by the prolific and brilliant airplane designer Ed Heinemann, 2,960 of these successful jet bombers were built and they can fly at over 600 miles per hour. 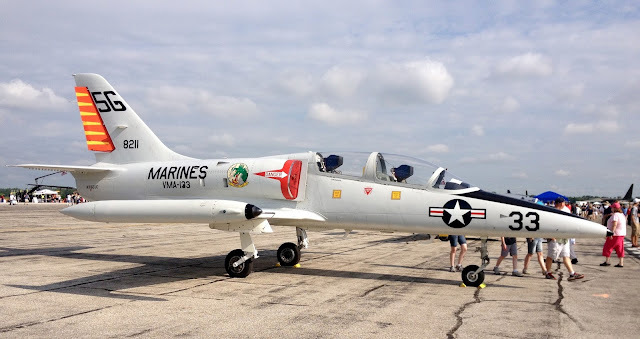 First entering service in 1956, the Skyhawk served the US military in Vietnam and beyond including with the Blue Angels, and with the Air Forces of Israel, Australia, Argentina, New Zealand, and Kuwait and is still in service today with the Brazilian Navy. The A-4 strutted its stuff not only on the tarmac but in the air. It just plain zipped through the air, showing its speed and maneuverability in a thrilling show for the audience. 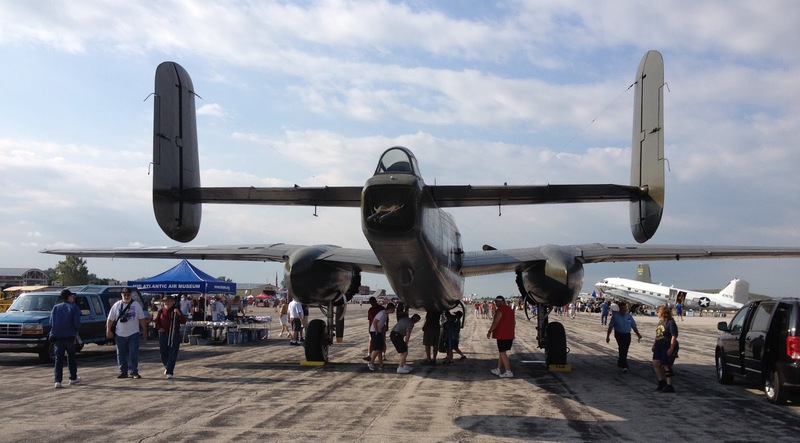 Normally you're lucky to be at an air show and see a single flying B-25 Mitchell bomber. 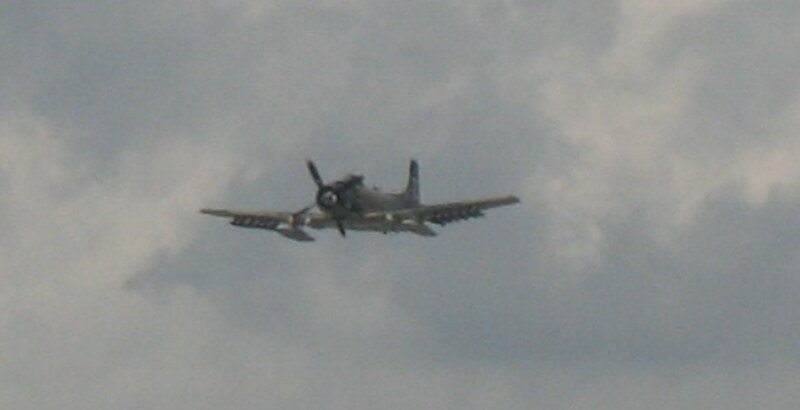 Thunder Over Michigan had two this year. 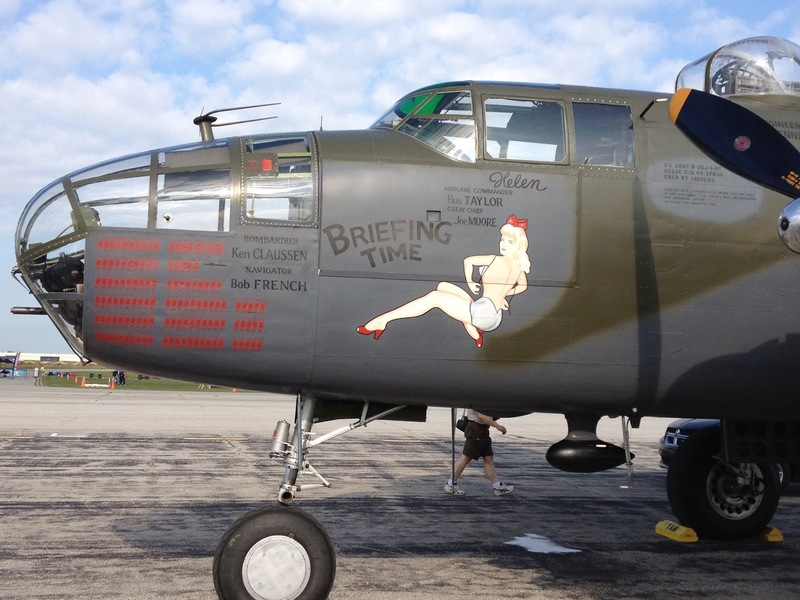 Back then planes had some serious nose art, as well as some impressive mission markings. Both bombers at the show were beautiful aircraft. 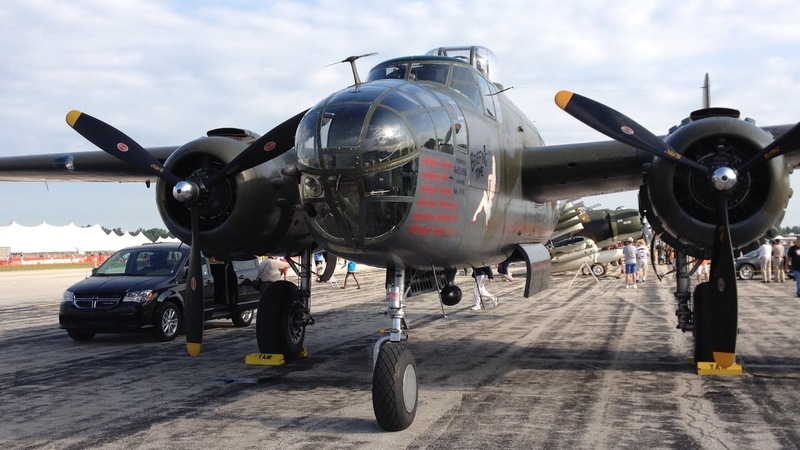 The B-25 was an excellent medium bomber, famous for being the first plane to take the war to Japan's home islands in the storied Doolittle raid. It also served extensively in Europe, the Middle East, and Russia in addition to the Pacific. No, its not a Grumman S-2 Tracker. 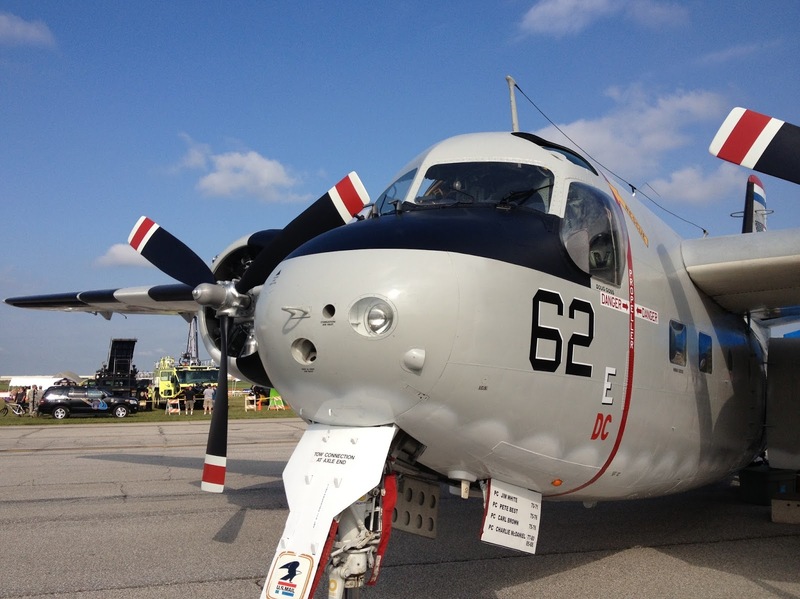 It's the Grumman C-1 Trader. The Grumman C-1 Trader is the COD (Carrier On Board Delivery) variant of the C-1 Tracker ASW aircraft. Delivering personnel, supplies and mail (complete with a US Postal Service marking on the front landing gear cover), 83 Traders were built, and according to Wikipedia only 10 are left flying in private hands. 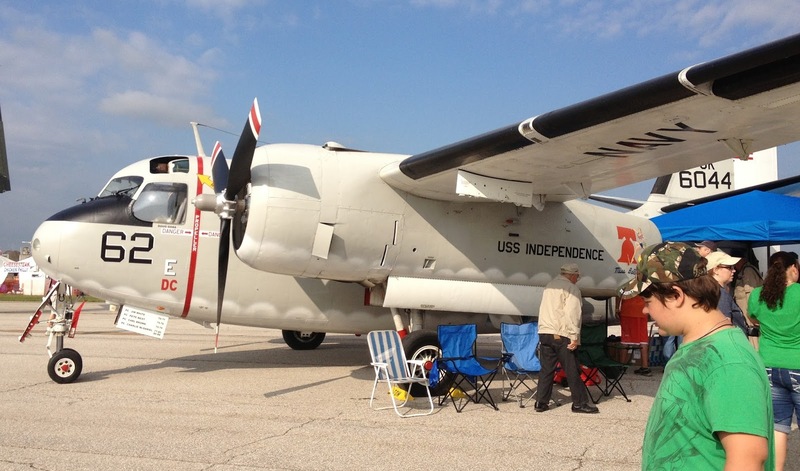 The current owner was by the plane and spent quite some time telling us about it, especially after Murphy's Law mentioned his stop by the S-2 Tracker graveyard. We learned a lot about the bird from its owner who was quite the patient and gracious gentleman and the kids liked listening to him. 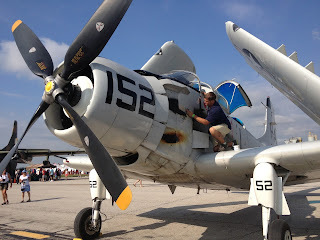 The seats for passengers face backwards so there is less stress on them during carrier landings. 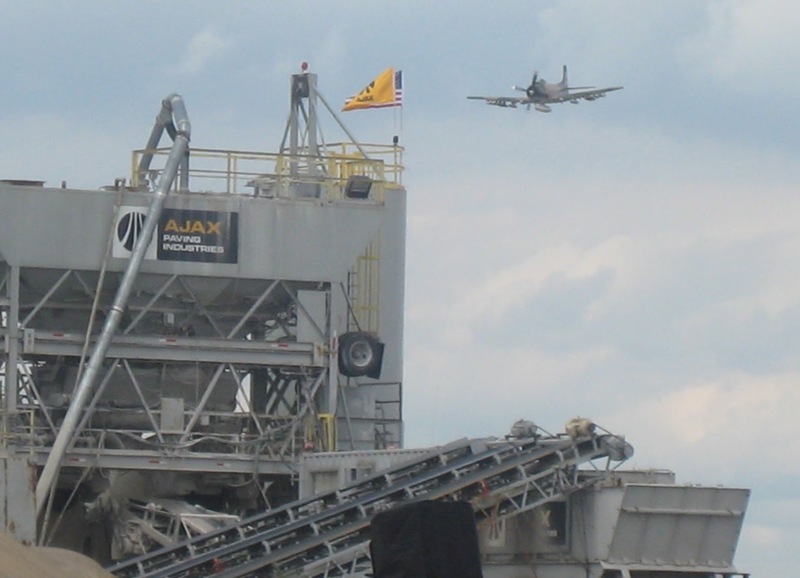 He also posed the riddle: Why and how did so many Traders log more carrier landings than catapult shot takeoffs? The answer is that these planes had sufficient power to take of from the carrier without the assistance of the catapult, and apparently a lot of pilots preferred leaving the carrier under their own control that way. He was offering internal tours for $2 a pop so while ML and I continued to listen to him tell us all about the planes history and what its like to fly it, I sent Leah and Abby on a reconnaisance mission to scope out the interior of the plane and bring back pictures. 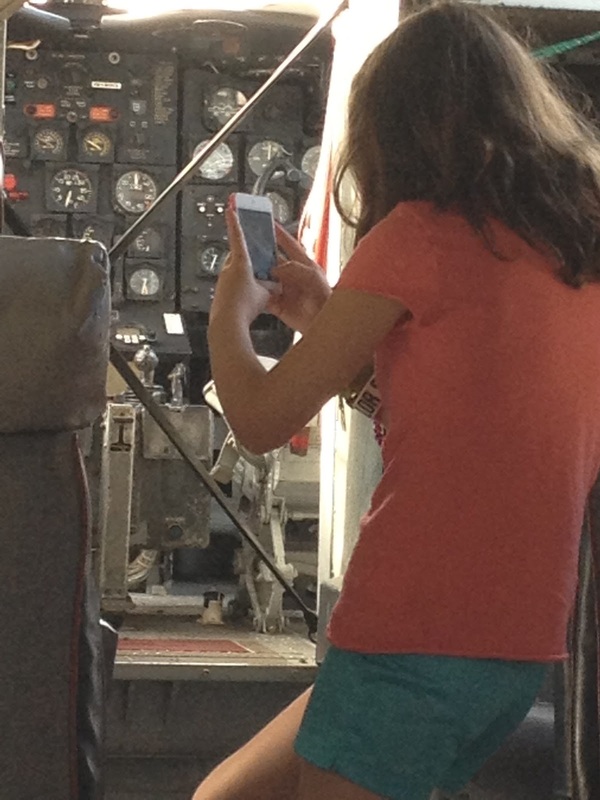 These kids took their aircraft documentation job seriously. 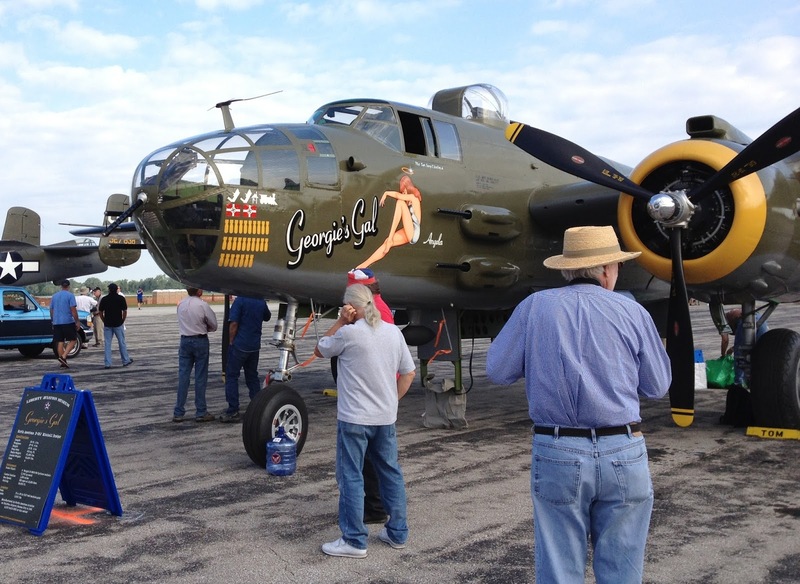 A beautiful plane, a gracious owner, and the kids got to explore a real piece of living history, and they highly enjoyed themselves. 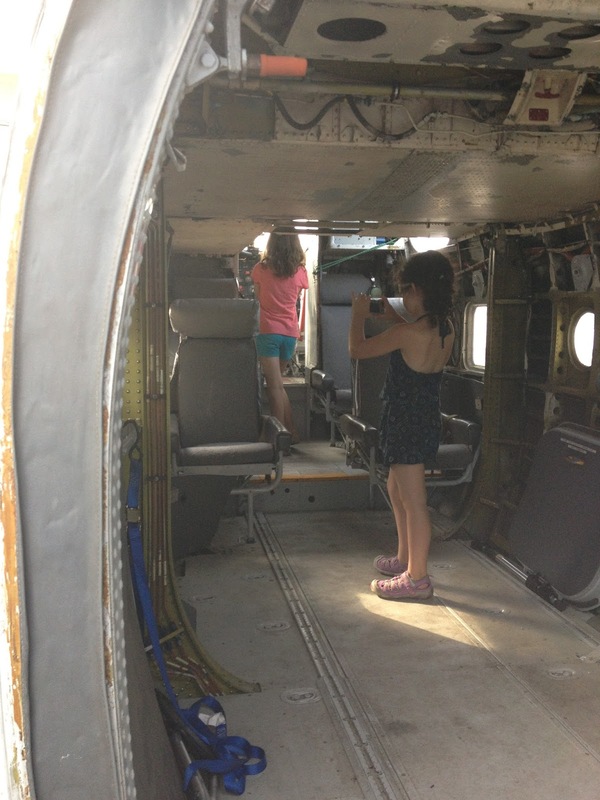 Sequestration, And Airshows, And Ospreys, Oh My! 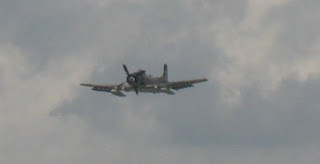 At Thunder Over Michigan some acts were very notable by their absence and thus will not be in any pictures. 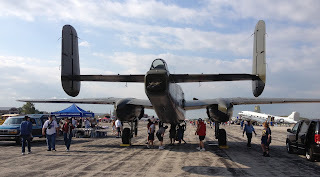 There were no active military airshow exhibits or demonstrations. 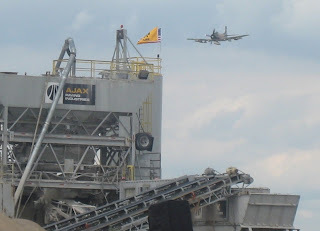 No Blue Angels, No Thunderbirds, No A-10s from Selfridge ANG doing a flyby, and certainly no Ospreys flying demonstration flights and wowing the crowd with their impressive capabilities. Due to sequestration and Obama's effort to make the most publicly painful cuts possible, there were no military demonstration teams attending airshows this year. However, even with all the sequestration going on, there's still plenty funds available to fly Bo the Obama's Portugese Water Dog in his own Osprey to Martha's Vineyard to join the Obama family who already traveled there separately at taxpayer expense on their latest vacation. 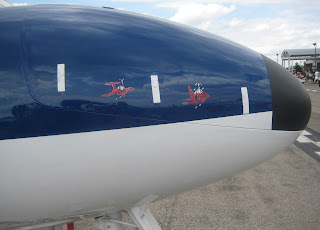 Apparently the latest sign of being amongst the .01% is having a separate aircraft for delivering your family pets whilst you're on vacation. Do note that the cost of just a couple of Obama's vacation junkets to the US taxpayer would likely fund a whole season of Blue Angels or Thunderbirds airshow exhibitions. 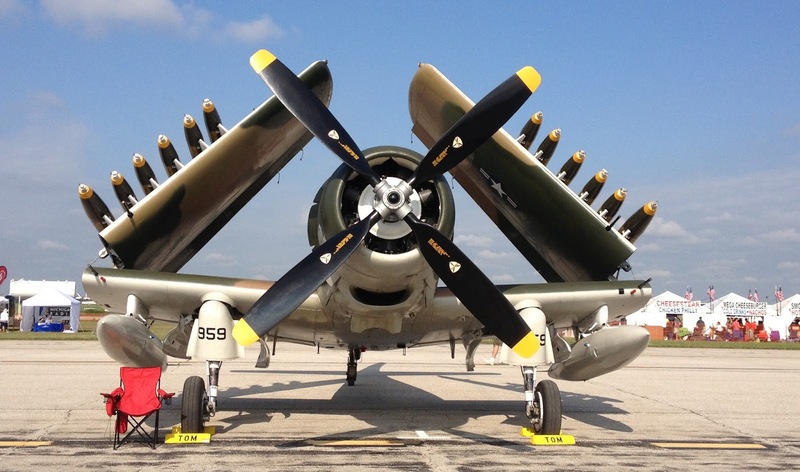 Thunder over Michigan had the largest gathering of flying Douglas A-1 Skyraiders of any Air Show and six were present and ready to perform. 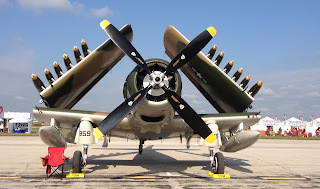 The Skyraider, brainchild of awesome airplane designer Ed Heinemann,was a workhorse of the US Air Force and Navy in the Korean and Vietnam Wars. Designed to be a replacement for the Navy's torpedo and dive bombers, it was able to carry up to 8.000 lbs of ordnance - More or equal to the carrying capacity of the B-17 Bomber. 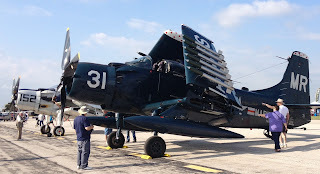 Here's AD-1 Skyraider "Bad News" - take a look at all that exhaust residue from running the Wright R-3350 radial engine on the cowling, and the (inert) ordnance on the wings. and variants had 4 seats. This is a serious beast of a plane. It served the US Armed Forces very well indeed. 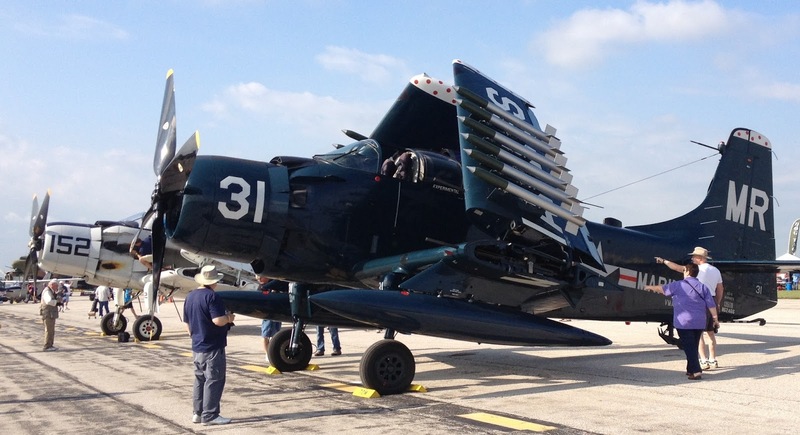 Skyraiders even shot down MIG-17s during the Vietnam war in addition to bombing and close air support missions and in its most famous role as "Sandys"- close air support during pilot rescues featured in many a movie. The sound that engine made was magic. 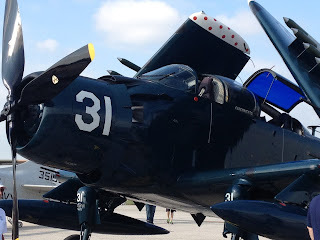 The Skyraiders at Thunder Over Michigan were worth the price of admission alone, but there was lots more to see and do than just the Skyraiders.